Last year when I was in Japan I had two opportunities to try out Hatsune Miku VR; first at the 2015 Miku Magical Mirai expo, and then again at Tokyo Game Show. In both cases I ended up missing out thanks to a combination of bad luck (Only one in 20 or so got to try Miku VR at Magical Mirai and I missed out), and bad organisation by Sony (not putting me on any kind of media list at TGS, and I was not lining up for three or four hours for any single demo). This year, however, I finally got lucky. As media I was allowed in to the Magical Mirai 2016 expo the moment the doors opened, and right in front of the media entrance was the Miku VR booth. So I was able to jump in and have a go before the lines started to grow and people started to get turned away again. 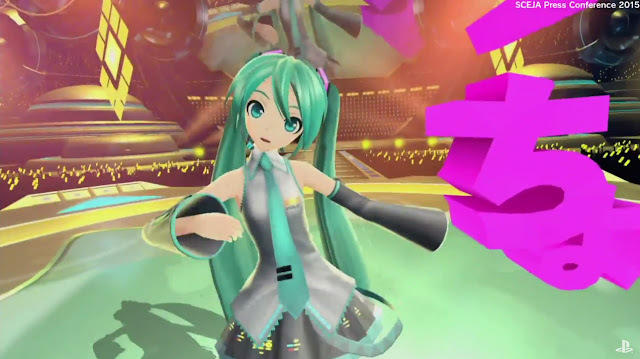 Miku VR is going to utterly remove me from reality. It's that good. 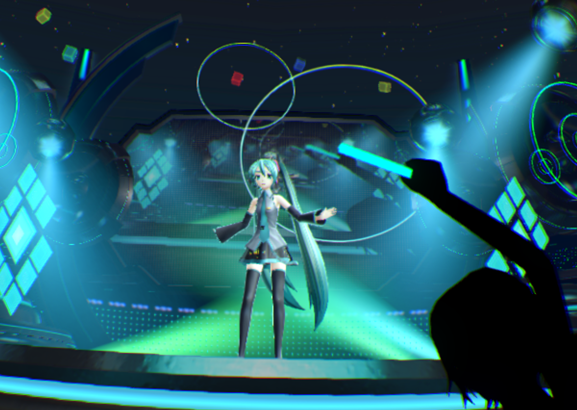 I'm not sure just how close the demo is to the eventual Miku VR game, though I suspect it will be significantly different, as this demo wasn't overly playable; I seemed to have to move the PlayStation Move controller in time with music and in specific directions, but that was an afterthought - the demo really wanted me to just focus on the performer. Either way, even if it is a purely passive "watching" experience, I'm still completely sold on it. I started out in the audience, front and centre, as Hatsune Miku popped up on stage right in front of me, and started her singing and dancing. I was able to instantly move between two viewing locations - the ground floor and a terraced view, looking down from above. At some point (and I don't really know how) I wound up on the stage itself for an even closer look. All the time I was waving a light baton around (the PlayStation Move) as though I was at one of the live concerts. With a good pair of headphones on, the experience was truly, genuinely, immersive. The level of detail that the development team have got into Miku is truly impressive. 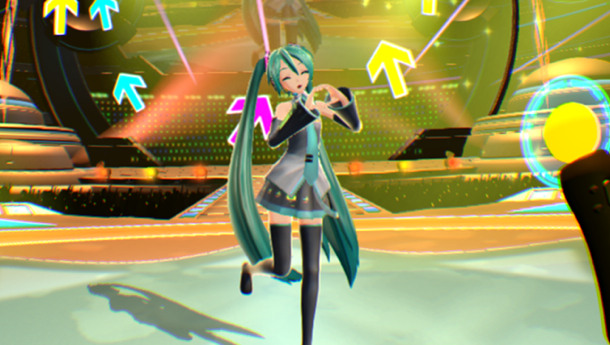 She's animated in a believably lifelike fashion, and I'm not sure if it's just the 3D effect of the VR when compared to static 2D screens, but everything looks smoother in motion than in any of the Miku games. There was a lot of colour going on at one point where a star platform appeared and lifted Miku up into the air to perform for the "people" in the terraces, and there was no noticeable slow down, despite animated bits coming in from everywhere. The only criticism I have probably has more to do with me; I still find VR googles to be a bit fuzzy at times on my eyes. I suspect, however, that that has a lot to do with my eyes needing a new check (and new pair of glasses) than the technology itself, and it's something that I experience with all VR games. It's clear enough that I'm still comfortable playing, though, and I found the head tracking to be incredibly smooth and realistic. The only other downside is that you do look like a bit of a dope while you're playing... and other people can see what you're looking at, so it's not the best kind of experience for private gaming. Embarrassingly, as the giant light star was lifting Miku into the sky mid-performance, the idea is that you're meant to move your perspective over to the terraced view in order to continue watching. I was busy looking around and waving the Move around in time with the music, so completely forgot about the button to change camera angles until well after, so any people watching saw me sitting there like a dope looking up Miku's skirt as she danced above me until I realised what I was doing and quickly shifted the camera. It wasn't intentional, I swear. I hope they don't think less of me for that. (Also I would expect that if this is a demo of the full game, the full game will force people to change camera angles, as SEGA's quite protective of Miku). Potential embarrassment aside, I was already quite sold on PlayStation VR from my previous experiences of it, but now playing a game that I really wanted to experience in VR, and seeing that my expectations were well and truly met, I'm well over the line. I'll be picking up the VR goggles the moment Miku VR lands.